It was a great pleasure to welcome 85 guests back to Aldenham for the Old Aldenhamian Society Annual Dinner 2017. This was a very special occasion, as Geoffrey Prall (SHE1936-40) turned 95 on the day. He celebrated by bringing a large cake, adorned with the Aldenham School crest, to share with everyone. Before the meal there was musical entertainment to please every ear from the age of 17 to 95, no easy feat with all the different musical genres there are. The evening kicked off with drinks and electric guitars, followed by a bit of Beethoven. These pieces were brilliantly played by three current students who impressed the gathered audience with their skills and confidence. Alice Erman (P2005-12) then took the floor for a wonderful repertoire of show songs. She was joined by Vicki Garson (P2010-12), for a rendition of ‘For Good’ from Wicked, a most appropriate piece for a reunion of friends. The session ended with a couple of Christmas songs and a little audience participation. It was a great way to get everyone in the mood for fun. The Dining Hall was decked out in McGill’s colours at the request of the new President, James James-Crook (M1968-72). The School Grace was said by John Edwards (B1946-51). The three course meal was excellent, judging by the clean plates and contented faces around the tables, when service was complete. Guests were invited to wish Geoffrey Prall a very happy birthday and he was presented with a gift from the School by the youngest person present, Head Girl Phoebe Altman (P & R 2011-17). The Headmaster was the Principle Guest Speaker and he focused on the changes in the School since Geoffrey Prall was born in 1922 and when he was at the Aldenham 80 years ago. He invited Geoffrey to speak about his experience, which was spellbinding; the boys had just one bath a week, wore grey woollen socks that needed to be darned regularly and Geoffrey didn’t see his father, who was in the RAF, for over 2 two years, after being dropped off at the School at the tender age of 13. The guests were in awe of this gentleman who told a story of being selected to play the part of Portia in The Merchant of Venice and then bumping into to the Master who had appointed him in that role, when he was in the Navy during the war, walking down a street in Sydney. He finished by commending the Headmaster and the Governors in all that they have done to bring the School to the place it is today and enjoying great success, he is obviously proud to be an OA. 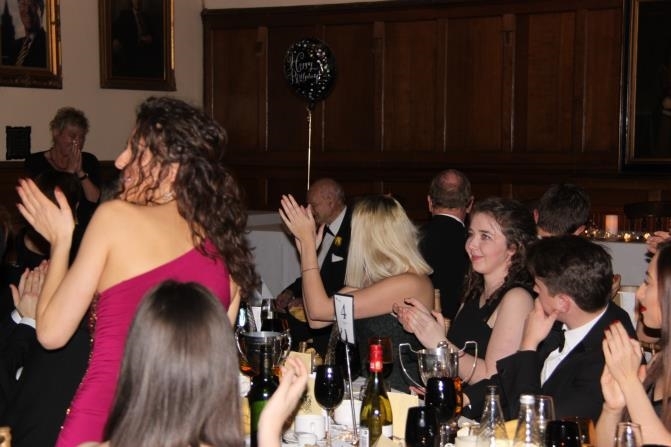 The President took the microphone to address the gathered crowd, offering congratulations to the Aldenham Fives Club and in particular Andrew Rennie (M2006-13), for becoming Regional Champion recently. He is the first OA to have achieved this title. He welcomed members of the OA Golf Society who were out in force and the newly formed OA Choir, encouraging others to support their plans to sing at a variety of venues next year. This was another very successful OA event and there is room for more to attend next year, so book early if you can!